If bladder cancer is suspected due to presence of blood in the urine or bladder symptoms, you will generally need 3 investigations. Imaging is always required, either ultrasound or CT scan to look for any lesions or masses in the bladder. Specific urine tests are required to look for the presence of cancer cells in the urine. You will need to undergo a cystoscopy to visualize the bladder to look for tumours that may not have been identified on xray, and to biopsy or remove them if found. 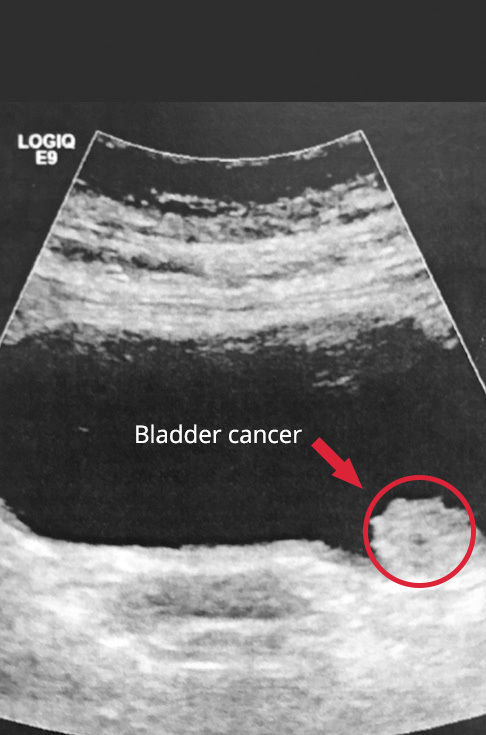 Bladder cancers are often identified after a patient notices blood in the urine. Occasionally tumours are identified after a patient has an infection or can even be noted on ultrasound performed to investigate voiding symptoms. When a bladder tumour is first identified the patient will need a cystoscopy to look into the bladder with a telescope. This will enable the Urologist to take samples of the tumour and in most cases to remove it completely. This is called a biopsy or, if the tumour is larger, a transurethral resection of bladder tumour. In most cases, bladder tumours only involve the surface lining of the bladder and after resection will have been completely removed. Bladder tumours have a very high rate of recurrence and ongoing surveillance programs will then be required for the future. This involves regular cystoscopies for many years to come to detect any recurrent tumours when they are small and non-aggressive. If at the time of resection of the bladder tumour, the cancer has been found to invade into the wall of the bladder you will in most cases require more aggressive treatment which usually involves surgery to remove the bladder or less commonly radiation. Chemotherapy is occasionally used in the treatment of bladder cancers but the mainstay of treatment involves surgery and less commonly, radiation. If a large tumour has been resected you may be required to remain in hospital for several days with a catheter tube to drain the bladder. This allows any bleeding that may have occurred to be controlled and allows the bladder to heal a little before normal voiding is re-established.